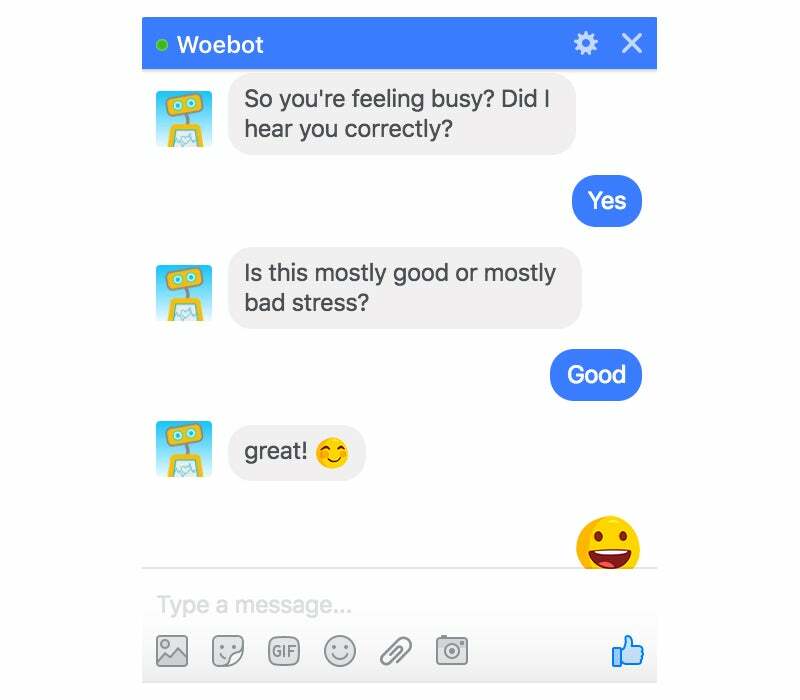 Not everyone is comfortable seeing a therapist or has access to one around the clock, but Woebot is available 24/7 via Facebook. Almost one in five Americans suffers from an anxiety disorder, and although these ailments are highly treatable, only a third of those afflicted seek help. About 16 million people, or 6.7 percent of the U.S. population, have suffered at least one major depressive episode within the past year. In some circles, mental illness is still considered taboo, with many people dismissive of conditions and saying things such as "toughen up." If someone manages to overcome these pressures and seeks treatment, he or she had better have insurance to avoid high fees. While online therapy providers such as TalkSpace, BetterHelp and Breakthrough all gives users access to therapists, the barrier to entry for these services can be high for people who have a hard time realizing or admitting they need help. Meanwhile, it can be difficult to open up to another person. If an individual gets a bad impression from a therapist, he or she may retreat and not seek care again. That's why it may be time to send in a robot. 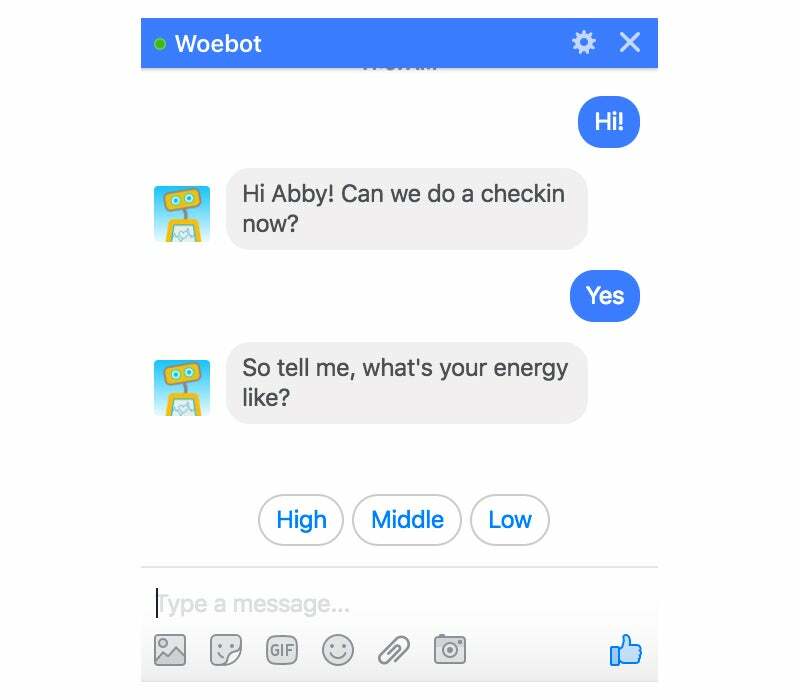 Woebot Labs Inc. is a small company based in San Francisco which on June 6 brought its eponymous Facebook chatbot out of stealth. 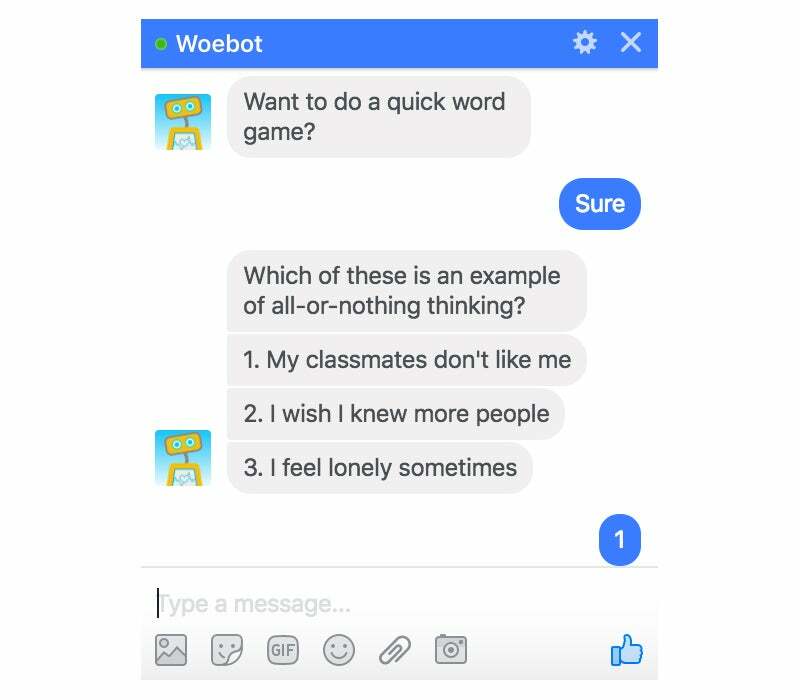 Woebot, the chatbot, is trained in cognitive behavioral therapy (CBT), which focuses on strategies, skills and thoughts to improve a patient's well-being, as opposed to discussing your childhood or deep-seeded fears. "CBT is such a readily translatable treatment for digital therapies, because it's just really structured, it's based on data, it's time limited and it's evidence based," says Dr. Ali Darcy, Woebot's founder and CEO who has a PhD in psychology. "The big realization lightbulb moment -- one of the big ones for us -- was that actually, some people don't want to talk to a human. That's kind of the value proposition of Woebot is that he's very much a robot." You may be thinking, a chatbot? Really? I can barely order pizza with one. Scientists have been programming computers for psychotherapy since the 1960s (see: ELIZA), but today they show more promise for adoption now that artificial intelligence is smarter and everyone carries a device in their pocket. Woebot has already delivered impressive results, according to a study published by Darcy and two researchers from Stanford in JMIR Mental Health. In the experiment, 70 participants ages 18 to 28 were split into two groups. One group used Woebot, while the other read the National Institute of Mental Health ebook, Depression in College Students. After two weeks, the group who used Woebot reported significantly reduced symptoms of depression compared to the control group. Since launch, Woebot has received more than eight million messages from users in 125 countries, according to the company. Darcy attributes Woebot’s early widespread adoption largely to word of mouth. All conversations with Woebot are anonymized from profiles and kept private, she says, but users of the chatbot are still subject to Facebook's rules and privacy regulations. Woebot's services are available starting at $12 a week. The company will seek additional funding and has plans to release standalone apps for iOS and Android. So no matter how many patients he has -- now I'm calling it a he. No matter how many patients Woebot has, it will remember the specific instances of that person because that's AI. Well that's it. It's an individual relationship with everybody. His original prototype was in Facebook, and we just did that because it's easy to build a prototype in Facebook. Then overwhelming feedback we were getting was that people loved that it was Facebook because -- I think this brings it back to the one of the first principles of therapies -- you meet people where they're at. And where they're at is on Facebook chatting to their friends in Messenger. They're not at a physician's office at 2 a.m. when they need to talk to somebody or get clarity around something. So I imagine that people who are interacting with Woebot will contact it after work, during work, right before they go to bed. There's no limit to it. The dose is actually similar to face-to-face therapy because if you add up all of the sessions that happen daily, they approximate one full [weekly] session. So the dose is the same, but as you mentioned, the actual time in which you're interacting with the robot is when you think of it or when you're struggling or when you're in crisis. I'm assuming if someone expresses suicidal thoughts then it probably refers them to authorities or other mental health professionals. What's the protocol for that? We basically assume that everybody's had at least elevated risk of suicidal behavior given that it's a mental health service. So he provides a helpline number, crisis text line and the National Suicide Prevention Hotline. He'll say, “If it's an emergency, always call 911.” But we also give a link to a free app that was developed by some colleagues of mine that are suicide prevention experts. And that app, it's been the only evidence-based app that shows that it can reduce suicidal behavior and self-harm behavior. It's interesting: Because of technology, a lot of these new kinds of anxieties exist, and now we're turning to technology to kind of treat them. But at the same time, these are people who may not have necessarily gone for therapy, but with this tool available to them, it opens up new avenues. I hope so. Part of Woebot's belief system is that there's no replacement for human connection and that everybody can use a bit of CBT because these are just good life skills and good tools. But it may not be sufficient for everybody, and he knows that, too. So if somebody's mood is really not improving over a long time, he'll call you out on that and say, "I think you should consider that I don't seem to be helping you that much, so maybe consider other options and let's talk through what some might look like." I'm going to wade away from psychology for a second and go into coding, which is something that I'm not experienced with. How do you program a chatbot? Is it certain keywords that people type, or is it like, “If X then Y?” How does it recognize behavior and how does it respond? I know that's probably an hour-long conversation, but the condensed version for me and everybody else. It's funny, because I see there are some really advanced chatbots out there and learning solutions and stuff and that's fine, but Woebot uses, the honest truth, a hodgepodge of different techniques. It's all been about whatever way that we can deliver the ultimate end experience that we're trying to replicate. We're trying to replicate the therapeutic experience. So if it's a decision tree at that node, do a decision tree with branching conversations. If it means context matching or token matching there and natural language processing here -- great. But we can only use techniques in places where we know that they are going to produce the desired [effect]. We're not trying to pass the Turing test. He's a therapy bot, so when people come on to use him for the first time, everybody's sort of testing the boundaries and we get crazy questions like, "Why is the sky blue?" And he's like, "I'm a therapy bot. Let's just talk about therapy for now." So you started out making video games. That's kind of a weird pivot. Well it is and it isn't. The whole point was, how do we redesign therapies in a way that it makes sense to people who are consuming it? Especially in video games and in Woebot -- part of the reason I call him "he" is that there's this suspended reality piece. People are willing to jump into this, and yet, you know that there's no actual person there that you need to worry about. So you're more free to explore and to kind of try on other identities and to say things that might be risky -- that's true of both video games and of the Woebot experience, so it didn't seem like a crazy, "Oh, we're doing something totally different." It seemed like, "Oh yeah, actually this is the way." Why are chatbots more effective than games? We realized the premise of rebuilding therapy was, we need to have something that's embedded in everybody's life but also that they are absolutely using every single day. Some people use video games every single day and then we had other people that were like, "No, I don't like games," end of story. There was too much frustration, and it felt like we couldn't really intervene with that. Woebot was one of several prototypes to find out the way that people will engage. We just got the numbers back and couldn't believe that people were checking in with Woebot all the time. Initially, we thought we shouldn't give push notifications -- they're annoying, right? So we didn't want to check in with everybody every day. And people started complaining and would say "Woebot, where were you? Why didn't you check in on me today?" I guess it was always the goal to marry technology with treatment. It seems to be the theme for your career. If we could somehow scale therapy through cups of tea or coffee I would have done that. But we can't. The thing about cell phones or technology is it's still immensely personal. There's never been a tool that we bring around with us like it. It always made sense to try and send something to it. What was your biggest worry about starting a company and what has been the best advice to kind of deal with that? Well, you know, you always worry that what you've created isn't helpful. It's hard to say -- I worry about everything. I need to use my product. I think there's also a lot of imposter syndrome, and especially coming from an unfamiliar background. Various things helped with that. I did a program at the Stanford Graduate School of Business called the Ignite Program, where they take people from engineering and scientific backgrounds and show you how to take something from lab to market. I think the best advice I've had is probably just to read a lot. Just frantically read. All the entrepreneurs that I really respect and admire constantly talk about the books that they're reading or have read or the advice that they have. There are amazing resources now. People are very willing to share their experiences and help entrepreneurs. I've been really lucky with the mentorship I've had. It's been absolutely top notch. Is there anyone that you that you look to for inspiration? Loads of people, I'd say. Maybe it's, you know, the Irish connection, but I'd say the Collison brothers [of Stripe] are really inspiring. John and Patrick, they're just a great example of people who are really smart, but they just read, and that's their big advice. They're very thoughtful in how they build a company, and I really like that. Andrew Ng has been huge. He co-founded Coursera. He democratized access to top-tier education in the same way that I want to democratize access to top-tier therapy. He's been a great help, too. A great mentor for me. A lot of people are suffering at a day-to-day level. Now we just need to start the conversation about, “What are the other options?” apart from things like very expensive, very hard to reach therapists who may or may not have room for you on their schedule. Because they are amazing and they're great, but there’s never going to be enough to go around.